When I chose my degree, many many moons ago, I knew perfectly well that Classics would never be of any practical use. As it turns out, however, that’s proven to be incorrect. To date, I’ve built six different cultures off the back of it, as well as a language based on Akkadian (Ancient Mesopotamian) and the gods alone know how many poems. For me, world-building begins with real life. It may be a fantasy setting but that’s no reason to do all the heavy lifting yourself. History – especially ancient history – has more in the way of weird cultural birthmarks, ridiculous wars and religious madness than you could ever come up with yourself. Use it. Glory in it. And then edit out the stuff that’s too ridiculous to be believable in fiction. Seriously. I tend to start by working out what basic flavour my fantasy culture should be. Is it European or something more exotic? What era is it, and therefore what level of technology? What’s the environment like, both in terms of terrain and weather? Is there a class/caste system? That gives me some parameters to work with and an idea of where to start borrowing. As an example, I’m currently building a culture which I want to make slightly exotic and highly decadent. The terrain varies from desert to steppes, and there is a strict caste system in place. Looking at a map of our world, the culture that fits those parameters best is the Persian Empire in the days of Alexander the Great. I have a place and time to start investigating. Now I need to find some cool bits and pieces to flesh out the history and culture of my fantasy empire. I’m not talking about taking whole centuries of events and transplanting them wholescale. Just the highlights that are both interesting and make the culture feel real. Because I live in London and am therefore ridiculously fortunate in the matter of resources, my first stop is usually the British Museum. Libraries, art galleries, anything like that – it’s all good. 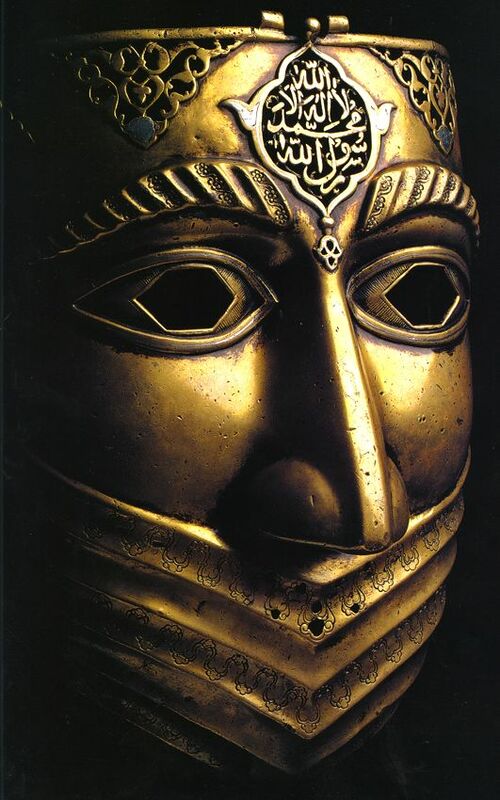 Iranian battle mask, C18th. Or, in my world, the face of a golem. Sticking with this example, I take a look at some friezes and artefacts recovered from various dig sites. I don’t restrict myself to JUST the era of Alex the G. Anything that strikes me as shiny gets noted down. Early Persian kings liked to hunt lions, as a symbol of their authority protecting the people from chaos. They also held lying to be the worst possible sin and went all-out on protecting doors with divine symbols as they considered doorways to be key locations through which good and evil influences could enter. That doesn’t really cover the truly decadent palace approach that I’m looking for, though. For that I turned to the excellent The Emperor by Ryszard Kapuscinski – a first-hand account of the reign and fall of Haile Selassie, King of Kings, Elect of God, Lion of Judah, etc etc etc. That tells me the relative importance of the second doorman in the Imperial audience chamber and how, during the Hour of Informants, the Emperor fed his exotic animals whilst listening to reports from the Intelligence Bureau. Finally, I put it all together by combining real and fantastical elements, and then working out the consequences. For example, elsewhere in my world setting it’s been established that elves are naturally the best at creative imagination. In other cultures this has led to them excelling as priests, storytellers, artists and so on. In a Persian-like culture, where lying and deceit is the most abhorrent crime, it results in elves being persecuted, declared unclean, and worse. Another example – I have decided the ruling caste are fae. Again already established elsewhere, they are immortal. What does that mean for a society? The people in charge never change, which contributes massively to political and cultural stagnation. New generations, if politically ambitious, have to resort to literally cut-throat methods of advancement. That sets the tone of the ruling elite. As far as resources go, there will be constant pressure due to an immortal and increasing population. So that leads to an aggressive expansionist model. The army becomes very important, and operates in the way that the Persian armies did (about which we have plenty of information). It also means that the frontier becomes a place of possibility for the new generations who don’t want to engage in vicious politics. They can set up new settlements in the newly conquered lands, and make a space for themselves that way. So we have an atmosphere for frontier life, and an overview of the country where generations are effectively set up like tree-trunk rings out from the centre. Ta-da! One fantasy culture based on historical evidence. Why bother with all that research, I hear you cry? (Well, I don’t because the internet doesn’t work that way and, last time I checked, I wasn’t psychic, but you know what I mean.) Why can’t we just make it all up, using our powerful imaginations and writerly know-how? The answer, of course, is that you can. Of course you can. But there are a few reasons why you might want to consider this kind of approach. Using a known culture gives your readers an automatic way in. They can see, from a few choice details, what you’re emulating and instantly populate it much more richly. That makes your story rich in their minds, which can only be a good thing. Guy Gavriel Kaye – a writer that both Andy and I have gone on about in the past – is an expert at doing this. There’s a reason we keep going on about him. As previously mentioned, it saves you some heavy lifting. If you want to focus all your writing energies on character and plot development, rather than filling in the details of the cultural background, this is an excellent way to help build up a rich setting without spending massive amounts of time working out a palace protocol that your reader will see one small part of, once. Inspiration! By all means make 99.9% of your fantasy culture up wholesale, but looking at existing things can give you some great inspiration. Did you know, for example, that Spartans gave women who died in childbirth a warrior’s funeral? Or that the labyrinth from the Minotaur myth actually comes from the labrys – the name of the ceremonial double-headed axe used in Cretan ceremonies, combined with a tendency to decorate the palace floors in mosaic spirals? That’s cool stuff which can inspire whole new avenues of make-believe you never would have thought of otherwise. People care about the strangest, most insignificant things. The less you get it wrong, the less upset they’ll be. Terry Pratchett once said that a fan drew a map of the Discworld according to descriptions given in various books, and worked out that the apparent wettest place in the continent was actually sitting in a rain shadow. Distracting people from the story is a bad thing, m’kay? Research – and borrowing from reality – helps avoid it. It’s fun? Well, I think it is.